The Space Shuttle: As the world knows, the US discontinued the Space Shuttle program. The shuttles were highly sought by museums throughout the country, including by Seattle’s Museum of Flight. The Museum lost out on receiving one of the Shuttles but it received the trainer, a full-size replica of the Shuttle on which astronauts trained prior to going into the real thing. Seattle was disappointed in not receiving a space shuttle, but frankly we think the Museum–and enthusiasts who visit the Museum–got the better deal. 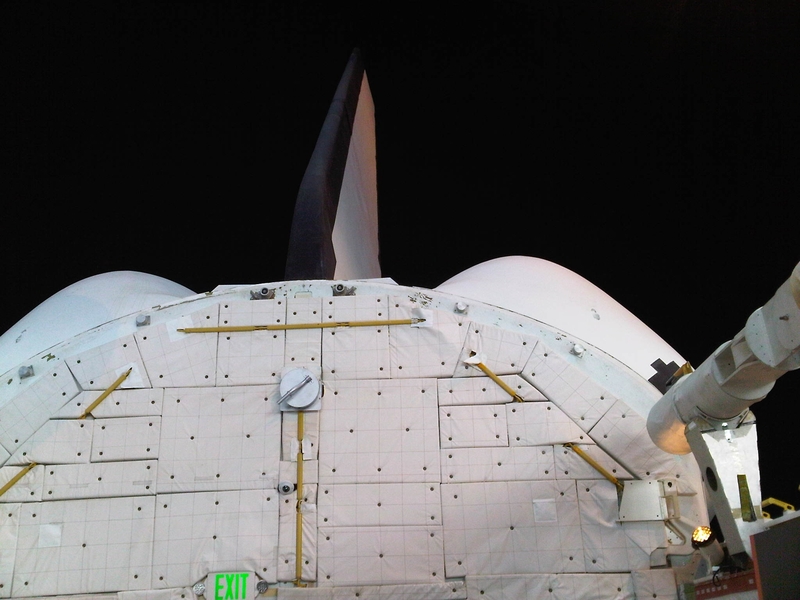 The real Shuttles, and the prototype Enterprise, are on display but access is restricted. Nobody can get inside one of these. On the other hand, the Museum of Flight offers tours into the crew compartment and cockpit (for a fee) and anyone who purchase admission to the general Museum can get into the cargo bay. The Shuttle was designed in the 1970s, so as you might expect, the cockpit was fundamentally technology of that era. Upgrades occurred throughout the program, but compared with the modern cockpits of today’s airplanes, the contrast is stark. The cockpit area is cramped, as is the crew compartment on the deck immediately below. This compartment is about 200 sf. In weightless space, the crew can double-up, floating in the upper area and sleeping in the cots. The space potty is in a corner of this compartment, and you can’t be modest. There is no door (but there is a curtain). NASA produced this video telling how you hit the head in space. The cargo bay is both bigger and smaller than you might think. On TV or in photos, there simply is no sense of size. Being able to walk into the cargo bay finally gives you the appreciation of how much–or how little–the Shuttle could carry. We once read the Shuttle is roughly the size of the DC-9, so this gives readers a point of reference. 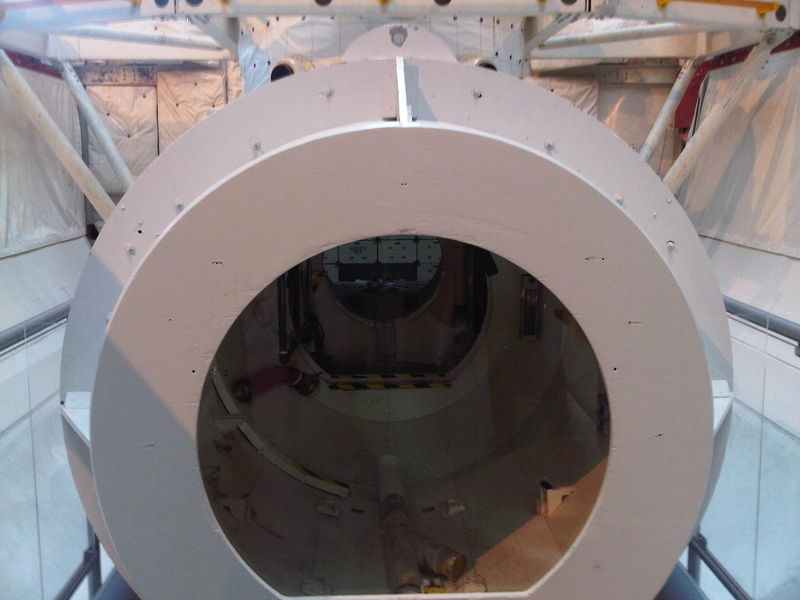 Entry to the cargo bay from the crew compartment is through a series of air lock doors. The diameter is only a few feet. 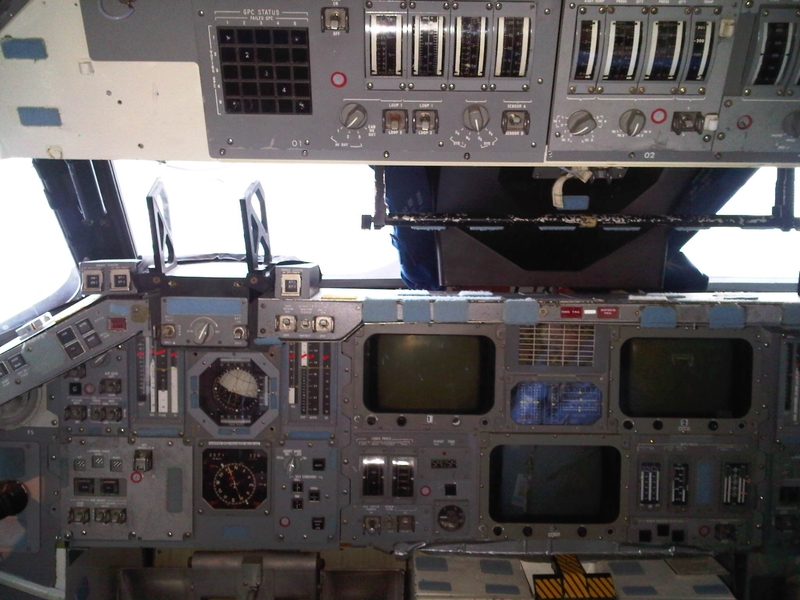 The photo above is from within the cargo bay (Exit sign added by local requirements–not part of the Shuttle….). 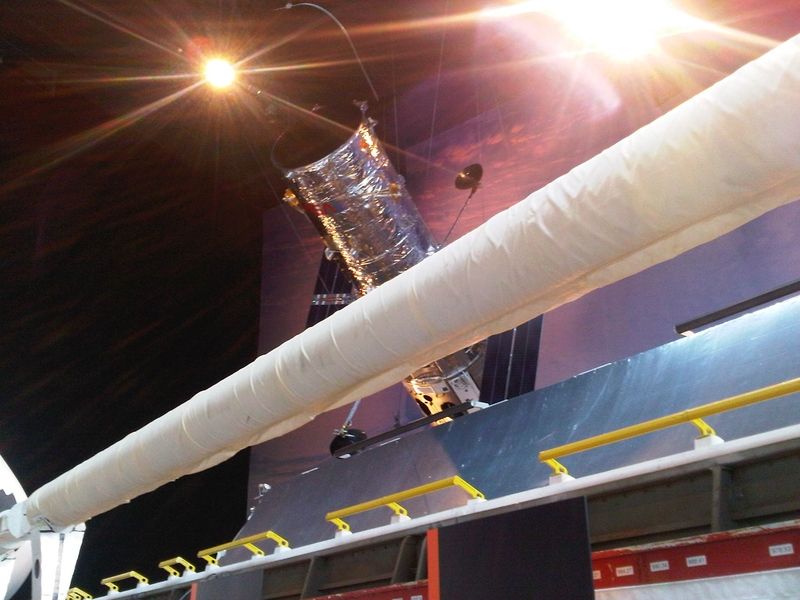 In space, the Shuttle flies upside down with the heat shields facing the sun. The photo below shows the open cargo bay door (port side) and a replica piece of cargo. 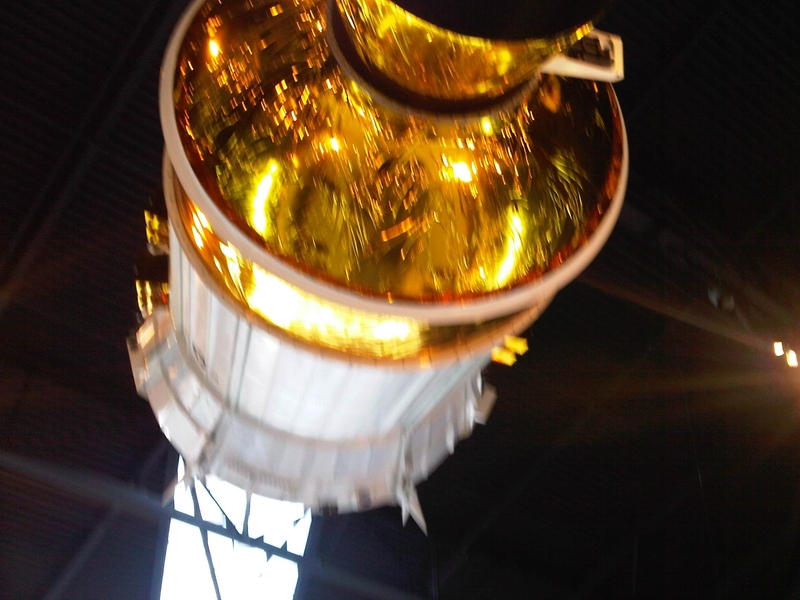 The photo below is a replica of a booster engine to thrust cargo much higher into orbit than the Shuttle can go. It was built by Boeing. Porter’s Community Challenge: The Toronto Star has this article detailing the challenge Porter Airlines has with public opinion following announcement last week of its ambitious plan to acquire up to 30 Bombardier CS100s and expand service from the highly restricted Toronto City Centre Airport. Aviation Week takes this analytical look at the plans. Notable in the report is that the CSeries order will lapse if restrictions aren’t lifted by year-end. This is a great addition to Seattle’s Museum of Flight. I will visit it one day, since we don’t have one in Houston. But we do have NASA there, and a few mock-ups of the Shuttle Orbiters. We also have one of the last Saturn V rockets, lying on its side in Houston, a very impressive machine from the 1960s. I have plenty of family and friends in the Greater Boston Area, and my prayers are with them this week. About one hour from Frankfurt airport by train or about 40 minutes or 3 hours by car. Thanks for that – so they’ve finally got that on display! Nice display for sure, better than the static ones. Immediate reaction from many people in the Houston area was that the Orbiter disposition decision was politically tainted. For example, this was the explanation of my old Rice classmate Annise Parker, her honor the Mayor of Houston. Maybe there is some truth to that. It’s hard to say what goes on inside the Washington beltway with any certainty. But my suspicions lie closer to home. Houston didn’t get an orbiter because Houston didn’t deserve it. Thanks for the info about the flight museum. My wife and I will be visiting the area in May and I will have to drag her there for an afternoon! I find it interesting that Mr. Deluce claims that Transport Canada already had a “runway” extension of 150 metres in mind. The article then goes on to claim that only another 18 m is required. 1. Is this 150 m meant to be at at each end (for a total of 300m)? 2. If Transport Canada is adding this extension as part of an international effort at increasing safety zones, would not the runway extension required by Porter not have to be on top of that which Transport Canada has in mind (336 m for Porter plus the 150 m or 300 m that TC will require)? 3. All the talk up until now is of the C-100. Would it not be prudent of Porter to plan for the possible use of the C-300 at some future point in time? Assuming they get the first one, I don’t see a further runway extension being agreed to for a long, long time thereafter. Three questions, not two. Somewhow explorer reverted to an earlier draft of my comment. I had mentioned the inconsistencies of the Globe article: Porter requesting 168 m at each end whereas Transport Canada supposedly only requires 150 m and the article stating that only 18 m was missing. Leehamnet: “The cockpit area is cramped, as is the crew compartment on the deck immediately below. This compartment is about 200 sf. In weightless space, the crew can double-up, floating in the upper area and sleeping in the cots”. Indeed. There is a Soyuz module on display in the same room as the Shuttle. It’s like sitting in a three-row coach section of a 737. Just nitpicking, but in engineer-speak a rocket engine refers to an engine using liquid propellant wheras a rocket motor refers to a motor using solid propellant. The rocket motor in your photo is the first-stage of the two-stage Inertial Upper Stage (IUS). New survey indicates Two-thirds of Torontonians support Bombardier jets at Island airport.